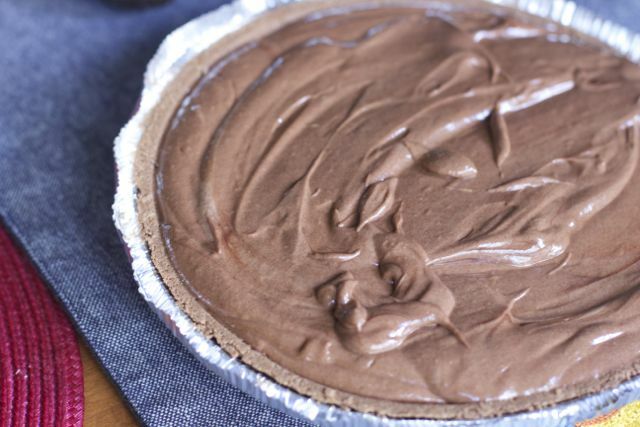 Before I even begin with this 5 ingredient Truffle Pie Recipe, my husband told me to put it in my top 5 recipes. Which to him means I am allowed to make it over and over again. Well good thing is this is such an easy pie recipe that I am happy to make it for any day of the week. I mean this ladies, you can make this if you can use a mixer and melt chocolate. I did not make my own chocolate crust but if you feel so inclined I would use chocolate graham crackers and make a regular graham cracker crust. 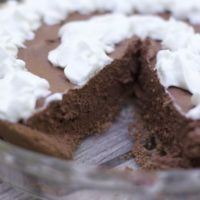 You don’t even need fancy chocolate, just don’t buy the real inexpensive ones that really don’t taste like chocolate This decadent 5 ingredient truffle pie is sure to be a crowd pleaser. Craving this pie right now. Sorry you need to make it about 8 hours before serving so the flavors can meld and the pie solidify. Make it the night before or during breakfast before heading to work. It is really that easy. 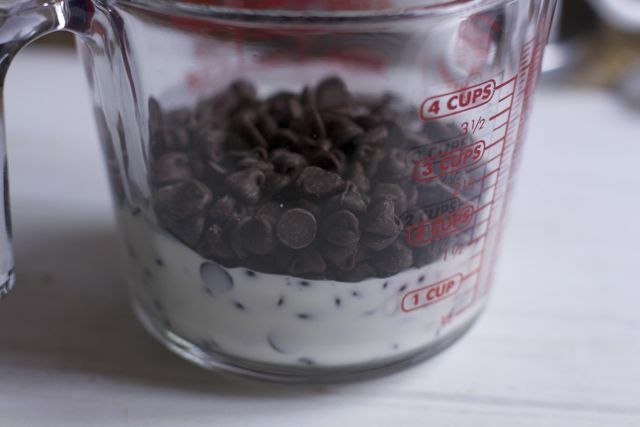 Melt the chocolate chips and some of the whipping cream in the microwave, stirring every 30 seconds so it doesn’t burn. I used a pyrex measuring cup. You are looking for a shiny mixture like this. Allow this to come to room temperature and then you can start whipping your cream. Slowly add the chocolate mixture until well mixed. Dump it into the pre made chocolate crust and refrigerate for 8 hours. You should not even be sweating at this point ladies, maybe drooling. 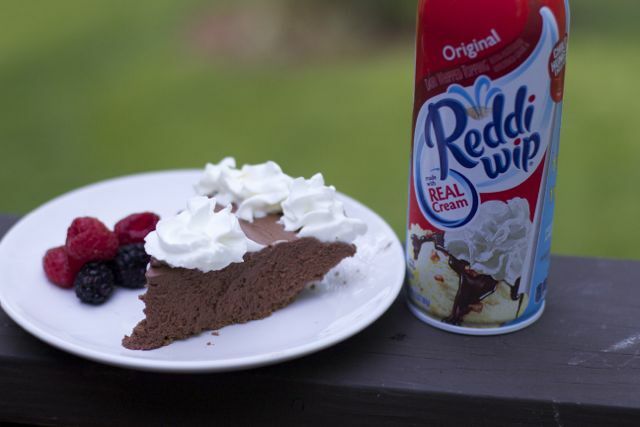 When you are ready to serve top with extra whipped cream for the ultimate 5 ingredient truffle pie. 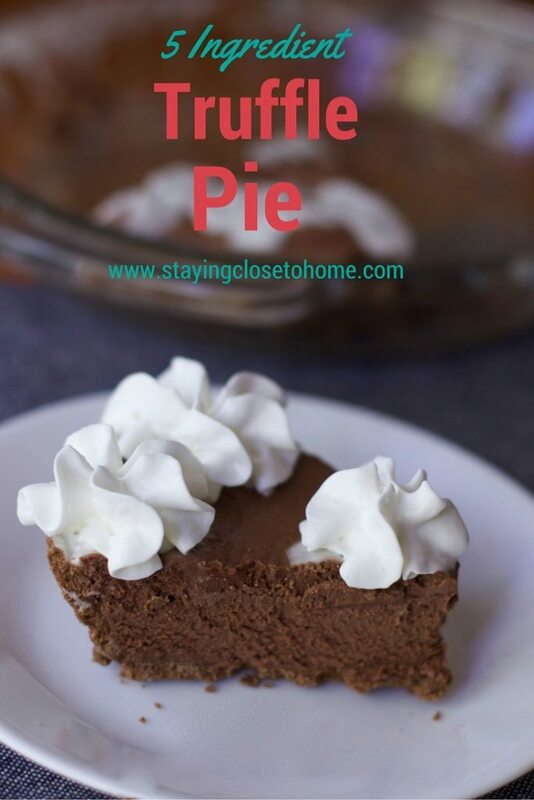 Pie is such an easy dessert recipe and it travels well for pot lucks or when bringing a dinner to a friend. Don’t be intimidated by making pies, I have made several in the past that are no sweat but very tasty pies. 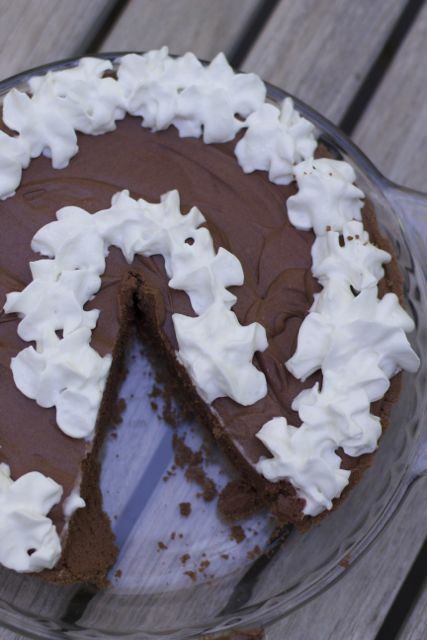 A super easy 5 ingredient chocolate pie recipe. Add chocolate chips and 3/4 cup cream to a microwave safe bowl and cook on High for 1 to 2 minutes, stirring every 30 seconds, until smooth. Cool to room temperature. Stir in sugar and vanilla extract. Set aside. 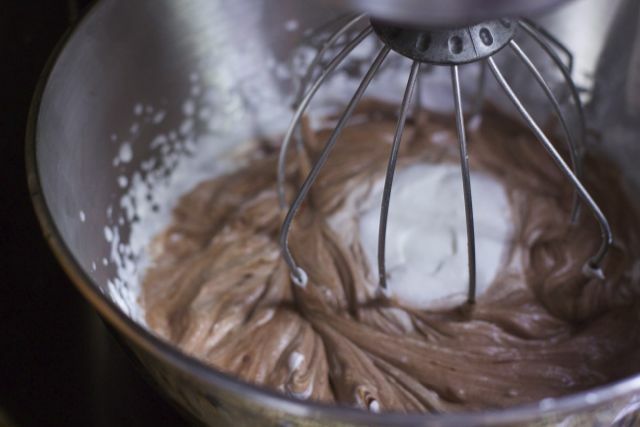 In a bowl, whip remaining 3/4 cup cream until soft peaks form. Beat in chocolate mixture on High speed 1/3 at a time until well mixed. Spoon filling into the pie crust. Refrigerate for at least 8 hours before serving so flavors can meld. Top with extra whipped cream for serving. 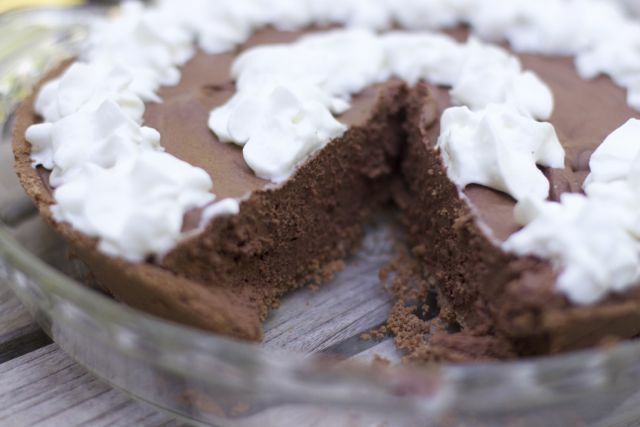 I might try this Truffle pie with other flavored chips and chocolate, maybe a butterscotch or a mint chocolate pie. What do you think? Looks so good and so easy. I might need to make this for my mom on Sunday. Yummy!!! That is one mighty fine chocolate pie. 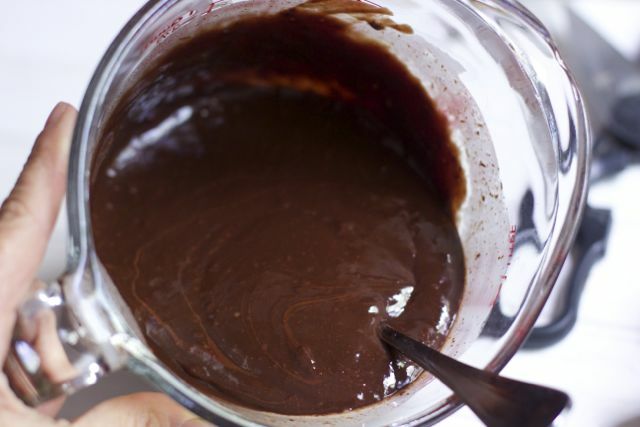 Perfect for those sweet chocolate cravings!! This looks delightful, and easy! It’s perfect for me! This looks SO good and best of all, it is easy to make too! I think I will be making this for Mother’s Day! Yum. I love chocolate. Looks so yummy and easy to make. Saving this for later on! I love the way this pie looks! I really think it would taste great too. This pie seems so easy and that is something that busy Mom’s love. The fact that your husband says to make it again, speaks volumes.